STRAZORS.com - all about classic razors - Adolph Kastor(Koster), 1856-1946. I made separate topic to write some words about the Great man in cutlery business - Adolph Kastor(Köster)*. Adolph Kastor was born in 1856. A young and ambitious son of a Jewish family from Wattenheim, Germany, immigrated to New York in 1870, riding high on hopes of working in the cutlery business. Kastor's uncle, Aaron, was already in the business and served as a mentor to the young man by providing the young Kastor job opportunities in his hardware supply business - Bodenheim, Meyer, & Company. Kastor started at the bottom - ironically - in the sub basement where he was put in charge of cow chains. As time passed, he worked his way on up through the ranks of the company to the firearms and cutlery department. This particular department at Bodenheim, Meyer, & Company was a seasonal business, with the time period of July-August-September being prime time - and Adolph Kastor was right in the middle of it all, cutting his teeth in the cutlery business. 1873 marked the year that the business suffered the loss of one of its founders and shortly thereafter restructured as Meyer & Kastor. By this time the business was not faring well, plagued with poor sales figures. In spite of the recent hard times, Kastor had learned a great deal about how to run the business - from the tedious financial aspects to the complete knowledge of all branches of Meyer & Kastor and everything in between. By September of 1876, the company closed up shop for the final time; all debts and assets were liquidated. It was not long after that happened that Kastor set his sights on starting a company of his own. On October 1, 1876, the 20-year old Kastor had his new operation up and running. Housed in a building on Canal Street in New York City, Adolph Kastor & Bros. began to fulfill the dreams of its founder by importing and distributing German-made knives. Everything went smoothly until 1897, which marked the year the Dingley Tariff was enacted. This legislation was drafted to promote domestic manufacturing. Thus, it rendered knives too costly to import with its protective tariff on all imported steel products. The only solution Kastor saw was to manufacture knives right here at home, in order to keep his prices down. Kastor opened a small cutlery and hardware store, and was soon joined in this venture by his brother, Nathan Kastor. In the 1880's, his two younger brothers, Sigmund and August joined the business. At first, A. Kastor & Brothers did all their importing from Sheffield, England. During the 1880's, the Solingen Germany cutlery industry surpassed Sheffield in efficiency, and produced knives at a lower cost. Kastor & Brothers began importing the German product, and soon Solingen was their chief supplier. Nathan Kastor returned to Germany in the late 1880's as a buyer, and later established a factory, the Germania Cutlery Works in Solingen. Nathan used Swedish steel in his razor blades! * In 1938, the Nazi leadership seized the factory. Many of the Kastor imports were made in this plant. This company was one of the true giants of cutlery importing. Eventually, their business consisted exclusively of supplying wholesale firms. "Imperial Razor Company" was one of their earliest trademarks. 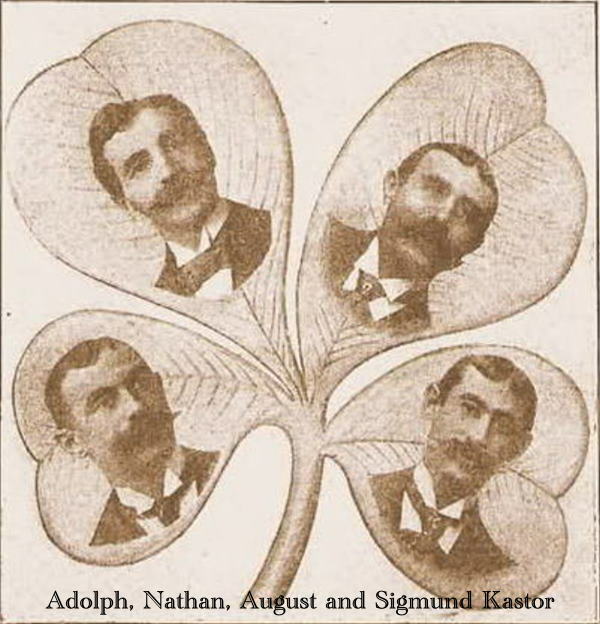 Perhaps the most famous trademark used by Kastor & Brothers was the four-leaf clover. About 1901, Kastor & Brothers purchased the Camillus Knife Company of Camillus, New York. They renamed the firm the Camillus Cutlery Company in 1902. Eventually the Kastor name was dropped, but it is still in business as Camillus. Kastor & Brothers was at 126-128 Duane Street, New York City in the early 1890's. By 1906, they had moved to 109 Duane. In 1916, the address was 190-111 Duane. The members of the firm in 1916 were Adolph, August, and Alfred B. Kastor. In 1934, they were at 1239 Broadway with Alfred B. president. In 1941, they were at 245 5th Avenue. Alfred B. Kastor was president of both the Camillus Cutlery Company, and A. Kastor & Brothers at that time. By 1946, they were at 60 East 42nd Street. In 1946, Adolph Kastor died. 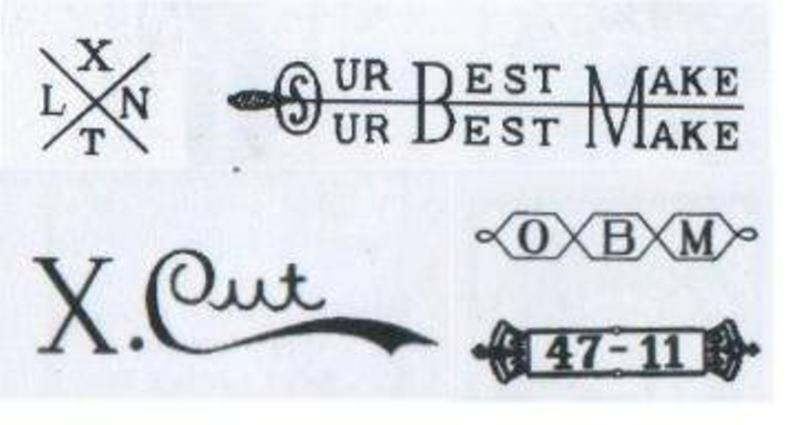 In 1947, the name Kastor & Brothers was dropped, and all trademarks were assigned to the Camillus Cutlery Company. The trademarks "XLNT" and "Clover Leaf Brand" are seen on many knives by different makers, especially by German makers. Kastor & Brothers used the following trademarks: Clover, EBRO, XLNT, Imperial, Tip Top, etc. • Hibbard, Spencer, Bartlett & Co. - O.V.B. (Our Very Best). H.S.B was one of Camillus' larger private label customers. • A.F. Shapleigh Hardware Co. - Diamond Edge. * - The additions made by Elliott Kastor Bryer, August Kastor's grandchild. Sigmund, on the lower left petal, was the lead or controlling director of "Wade & Butcher" in Sheffield during WWI specializing in straight razors. "Germania" became a school during WWII and then the largest umbrella frame factory in Germany. The plant now manufactures computer parts. Camillus buildings was sold at auction in October, 2011. "Acme United" bought the brand name at auction in Feb.'07 and started using it again in 2009.